According to statistics there are well over 100 million frequent users of cannabis worldwide, but it is unclear how many of them could be considered, or consider themselves, as medicinal users. Currently, most information available on the effects of cannabis comes from studies on the recreational use of cannabis, with the result that new medicinal users and their physicians are easily concerned with typical abuse risks, such as addiction, overdosing and intoxication (feeling ‘high’). Physicians find it hard to get reliable information on therapeutic cannabis use. Cannabis and cannabinoids are rarely discussed in medical school, and even the existence or the function of the endocannabinoid system (chapter 4) is largely unknown among medical professionals. Cannabis seems stuck in the middle; on the one hand too potent to be regulated as an herbal (or alternative) medicine, on the other hand too herbal to be regarded as conventional medicine. As a result, there is no clear consensus on where the line should be drawn between the appropriate medical use of the cannabis plant, and its use as a recreational drug. Randomized, placebo-controlled, and double-blinded clinical trials are the current gold standard for determining the efficacy and safety of medicines. Such studies are costly and very time-consuming, but by weighing the benefits versus the risks, they help us decide where and when the use of a new medical treatment is appropriate and responsible. Clinical trials performed to determine the effects of cannabinoids often show significant limitations, such as a focus on isolated cannabinoids (e.g. Marinol) rather than on herbal cannabis, and the use of low doses because of fear of overdosing the patients. On top of that, clinical researchers often have a hard time obtaining the licenses needed to study cannabis, finding standardized cannabis products suitable for research, and dealing with practical problems related to studying unconventional preparations such as smoking, vaporizing or edibles. In contrast, self-medicating patients can often choose from a wide range of cannabis products (even though this may be illegal), from which they pick the optimal cannabis variety, dose and administration form by a process of trial and error. Additional reasons that can explain why people choose medication with herbal cannabis over conventional therapy include cost issues, distrust in modern healthcare, or an interest in ‘green’ medicine. Many patients have heard about cannabis medicine from other patients or from recreational users. Sometimes cannabis is more effective than pharmaceutical drugs and/or people use cannabis to help them cope with the side effects of, or to replace, these medications. Because of all these reasons, experienced patients may actually know more about the advantages and disadvantages of treatment with cannabis than clinical researchers do. An important way of finding out the medicinal value of cannabis is therefore by performing surveys among large groups of patients. According to the most recent and largest-ever survey among 953 patients worldwide, the top 5 symptoms for using cannabis were chronic pain (29.2% of those surveyed), anxiety (18.3%), loss of appetite and/or weight (10.7%), depression (5.2%), and insomnia or sleeping disorder (5.1%). Several other studies have identified the same symptoms, specifically chronic pain, as leading reasons for using cannabis medicine. In this chapter we will discuss in more detail what medical conditions might be treated with cannabis, and what could be the mechanisms behind those effects. The fact that cannabis has a clear effect on humans does not necessarily make it a medicine. After all, alcohol and tobacco have clear effects too, but not many consider them to be medicinal. So let’s first explore the most prominent physiological effects of cannabis. Most of these effects are the direct result of the THC present in cannabis, but we increasingly understand how other components such as CBD and the terpenes add to the medicinal effects as well. 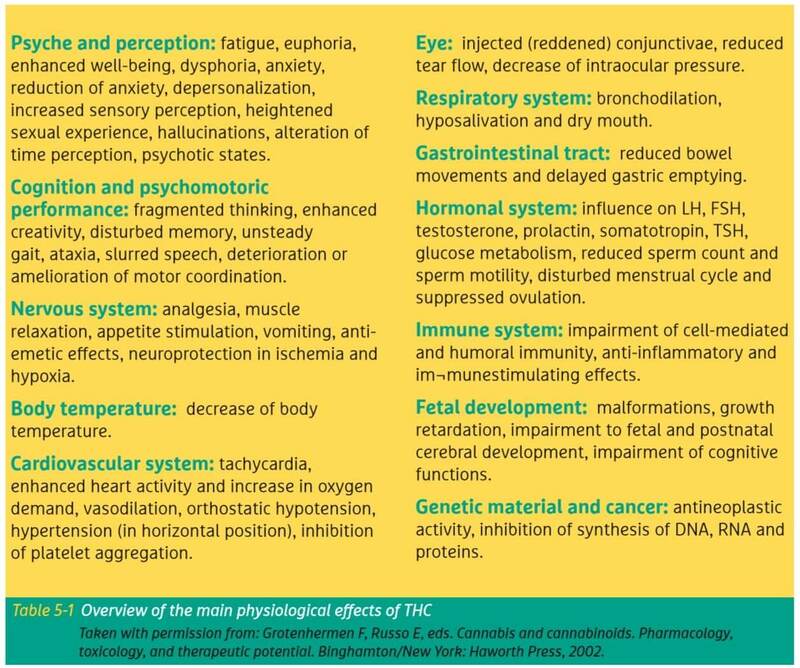 Table 5-1 summarizes the wide range of physiological as well as mental functions effects that have been observed for THC. One of the best known effects of cannabis is euphoria, commonly known as ‘feeling high’ or ‘being stoned’. Besides that people may feel relaxed, have an impairment of short term memory, an increase in heart rate, may have uncontrollable fits of laughter, and experience changes in their awareness of the surroundings. Colors seem brighter, sounds are enhanced, and even mild visual and auditory hallucinations may occur. Often this is accompanied by a dry mouth and reddened eyes. In a medicinal setting these symptoms are mostly mild and disappear rapidly. For inexperienced users or after the consumption of high doses these symptoms can be more severe and may induce uncontrollable movements, anxiety, or derealization/depersonalization, but without the classic withdrawal symptoms. In virtually all cases these effects will disappear spontaneously and without intervention within a few hours. In the period from 1975 to 2012, at least 139 clinical studies were published on herbal cannabis or pure cannabinoids, together including about 9000 patients suffering from a wide range of medical conditions. Based on this wealth of data it has been confirmed that cannabinoids exhibit a therapeutic potential mainly as analgesic for chronic neuropathic pain, as appetite stimulant and anti-emetic for debilitating diseases (e.g. cancer, AIDS, Hepatitis C), as well as in the treatment of various symptoms of multiple sclerosis. Additionally, cannabinoids show promising results in the symptomatic treatment of spinal cord injuries, intestinal dysfunction, Tourette’s syndrome, hyperactivity and anxiety disorders, allergies, epilepsy and glaucoma. Perhaps one of the most exciting recent findings is that cannabinoids may be effective in the treatment of some forms of cancer, by not just ameliorating symptoms but actually attacking and killing cancer cells. However, more studies are needed before cannabis should be recommended for cancer, as explained in more detail below. 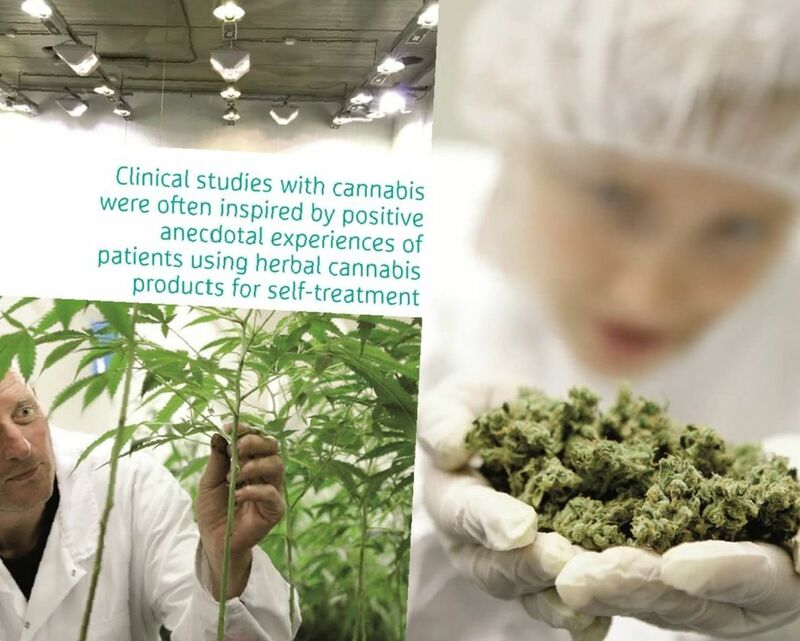 Clinical studies with cannabis or cannabinoids have often been inspired by positive anecdotal experiences of patients using herbal cannabis products for self-treatment. For example, the antiemetic, appetite enhancing, analgesic and muscle relaxant effects, and the therapeutic use of cannabinoids in Tourette’s syndrome, were all discovered or rediscovered because patients kept telling scientists and politicians about it. This clearly indicates the critical role that collecting data on actual patient experiences has played – and may continue to play – in our evolving understanding of cannabis effects. It is interesting to note that in recent years some well-designed studies on the effects of smoked cannabis have been published, mainly in studies on HIV/AIDS. This is of specific interest because most patients self-medicating with cannabis administer their medicine by smoking, while virtually no clinical trial has dared to study this controversial administration form. Such studies particularly show a benefit on neuropathic pain and appetite. Obviously, the noxious byproducts (tar, carbon monoxide, ammonia, etc.) released through combustion remain a reason to advice against smoked cannabis. Specific herbal vaporizers have been developed to provide a safer and more efficient delivery system for inhaling cannabis (chapter 3). It is reasonable to assume that future clinical trials will utilize this alternative delivery method more frequently. In the Dutch medicinal cannabis program, a number of medical indications have been selected as the primary target for cannabis treatment (listed in table 5-2).The reason is that for these conditions the most extensive clinical proof is available. Many patients suffering from these diseases cannot be helped sufficiently by conventional medicine either because there is too little effect or the side effects are too severe. These conditions will be discussed in more detail below. In general, medicinal cannabis does not cure these disorders, but it can relieve the symptoms associated with them or stop progression of the disease. Co-medication with cannabis may also enhance the effects of other medication, and/or reduce harmful side effects associated with them. In the Netherlands, it is up to physicians to determine whether treatment with medicinal cannabis would benefit a patient, depending on the specific diagnosis, symptoms and circumstances. In this, they are not limited to the list of conditions given below. A physician will usually only prescribe medicinal cannabis if the standard treatments and registered medicines are not having the desired effect or are causing too many side effects. Medicinal cannabis does not cure these disorders, but it can relieve the symptoms associated with them or stop progression of the disease. Severe chronic pain seems to be the major reasons why patients use cannabis medicinally. There are many types of pain and not all of them respond the same to cannabis. The therapeutic effects of cannabinoids seem to be most pronounced in neuropathic types of pain, meaning that the pain originates from damage or disease that affects the sensory nerves. This is the case for example in multiple sclerosis (MS), where the patients’ nerves are being attacked by his own immune system; or fibromyalgia, where the nerves become hypersensitive and record even a mild touch as pain. In contrast, studies measuring the effects on acute pain (e.g. postoperative pain) often show no effects. Most likely, this difference can be explained by the different role the endocannabinoids (chapter 4) play in both types of pain. Studies on severe pain indicate that the majority of cannabinoid side effects are preferable over the side effects caused by the prolonged use of high doses of conventional opioid medication. Chronic neuropathic pain is a common and difficult to treat condition that has limited treatment options. As a consequence, even modest therapeutic effects of cannabinoids may be relevant to suffering patients. It is interesting to note that a selective beneficial effect on women was observed in some chronic pain studies. This may be an indication that certain cannabinoids can help alleviate chronic pain conditions which predominantly affect women, such as fibromyalgia. Because chronic pain is so difficult to treat with any single medicine, cannabinoids have often been studied in combination with other pain medication, including strong opioids such as morphine. It was found that cannabinoids and opioids can work together, in such a way that their combined effect is stronger than may be expected. This effect is called ‘synergy’. As a result, addition of cannabinoids can often result in a lowering of the dose of opioids needed, thereby reducing the potentially severe side effects (e.g. respiratory depression) of opioid medicines. Many patients worldwide use cannabis to alleviate pain and muscle spasms or cramps associated with multiple sclerosis or spinal cord damage. Indeed, most clinical trials with cannabinoid-based medicine have been focused on MS. Standard therapy often provides inadequate relief and can be limited by side effects of the medication used. As a consequence, patients suffering from multiple sclerosis have historically experimented with many alternative therapies, including cannabis, to improve their quality of life. Nowadays, there is much scientific proof that cannabis and cannabinoids have beneficial effects on disease-related pain, bladder symptoms, tremor, and spasticity. Sleep also improves significantly by using cannabis, resulting in both deeper and longer sleep. MS is one of the few medical conditions where long-term effects of cannabinoids have been studied (mainly in the form of the pharmaceutical product Sativex®). These results have shown that patients do not seem to develop a tolerance for the medicinal effects, and they do not need to increase their doses in order to get the same therapeutic result over time. Although the medical proof supporting cannabis use for MS is still somewhat limited, it is important to note that the same is true for most conventional MS medications. Cannabis can have strong effects on nausea and vomiting associated with chemotherapy or radiotherapy used in the treatment of cancer, hepatitis C and HIV infection or AIDS. Already since 1986, THC – under the product name Marinol® – has been approved by the US Food and Drug Administration (FDA) as appetite stimulant in the case of anorexia associated with weight loss in patients with HIV/AIDS. Besides that, Marinol has also been approved as an antiemetic for cancer patients undergoing chemotherapy. Some study results suggest that the addition of THC directly before and after chemotherapy may offer more benefit than conventional medication alone. One well-known effect of cannabis consumption is the strong stimulation of appetite, also known as ‘having the munchies’. Mostly this is a desire for foods with high fat or sugar content. For patients, this high caloric intake may contribute to weight gain or even simply to absorb enough nutrients, which may be crucial in combatting some medical conditions such as AIDS related wasting syndrome. Although other drugs may be available to treat nausea, vomiting or lack of appetite, the combined effect of cannabis on all these symptoms at once make it a particularly potent drug for improving the quality of life of patients. Moreover, there is the inconvenience of taking oral medication in case of nausea or vomiting. Because cannabis can be inhaled (chapter 3) it is more convenient and works more rapidly than oral medication. Tourette syndrome is a strongly inheritable neuropsychiatric disorder, characterized by physical (motor) as well as vocal (phonic) tics. Many anecdotal reports have provided evidence that cannabis might be effective not only in the suppression of such tics, but also in the treatment of associated behavioral problems such as obsessive-compulsive behavior (OCB). Clinical trials investigating the effect of (pure) THC in the treatment of Tourette syndrome showed a significant tic reduction without causing significant adverse effects. Because the highly visible tics have an enormous impact on Tourette patients’ social life, even a small effect of cannabis could be considered as relevant. THC may therefore be recommended for the treatment of Tourette syndrome in adult patients, when first line treatments failed to reduce the tics. In glaucoma patients a progressive increase of pressure inside the eye causes a gradual loss of vision, resulting in total blindness if untreated. Studies in the 1970s already showed that cannabis, when smoked or eaten, effectively lowers eye pressure as much as standard medications. Because of this effect, cannabis medication may be able to save the eye from becoming permanently damaged. Although currently many treatment options are available, glaucoma is still one of the leading causes of irreversible blindness worldwide. In case conventional treatments do not have the desired effects, the use of cannabis may be advised. The duration of the pressure-lowering effect is typically in the range of several hours, so the cannabis medicine would need to be taken with regular intervals. Outside the view of their doctors, patients self-medicate with cannabis for a wide range of medical condition. Based on the available scientific evidence, three potential uses of medicinal cannabis that deserve some further attention are cancer, epilepsy and psychiatric disorders. As discussed above, cannabinoids exert palliative effects in cancer patients by reducing nausea, vomiting and pain, by stimulating appetite, and by improving the quality of sleep. But in addition, laboratory studies on lab animals and isolated cancer cells have shown cannabinoids to be capable, under some conditions, of inhibiting the development of cancer cells in multiple ways. As a result of such exciting findings, a growing number of amateur videos and reports have appeared on the internet arguing that cannabis can cure cancer. But although research is on-going around the world, there is currently no solid evidence from clinical trials to support such claims. It should be noted, however, that the potential effects of terpenes (chapter 2) on cancer, either alone or in combination with cannabinoids, have not yet been addressed in laboratory studies. Indeed, the combined effects of cannabinoids and terpenes are often claimed to be the major difference between ‘holistic’ herbal preparations of cannabis and pharmaceutical products based on single cannabinoids. Moreover, self-medicating patients often use extraction methods and/or administration forms that are quite different from conditions used in laboratory or hospital studies. Because of this gap between clinical research and real-life experiences, the curative potential of herbal cannabis preparations for the treatment of different cancer types remains unclear. Although epilepsy may be well controlled by existing medication, up to a significant number of people with epilepsy do not have adequate control of their seizures. Although surgery may be considered for difficult cases, this is a delicate, complicated operation with severe risk to the brain. For such patients, the use of cannabis may seem an interesting alternative to try first. As early as 1979, studies on rats already confirmed the anticonvulsant effects of (pure) CBD. In various subsequent animal and (small-scale) human studies on epilepsy, CBD in several administration forms was able to reduce the frequency and severity of seizures. Combined with an absence of psychoactive effects, these results indicate the potential of CBD as a therapeutic candidate for a diverse range of human epilepsies. Another upcoming, but only partially understood, application of cannabinoids is in the treatment of psychiatric disorders such as schizophrenia, anxiety and bipolar disorder. Although long-term consumption of high doses of THC has actually been identified as a risk factor for the development of such mental illnesses, other cannabinoids seem to have the reverse effect. In particular the nonpsychoactive cannabinoid CBD has shown potential in this respect, and cannabis varieties (chapter 2) high in CBD are being developed in many places around the world. Researchers believe that CBD may exert its effects on the brain by interacting directly with the endocannabinoid system (chapter 4). In a study using pure CBD, it was found this mechanism may lead to substantial antipsychotic properties in acute schizophrenia with an efficacy comparable to the standard drugs. Just like any other medicine, cannabis is not totally harmless. Below the most important risk factors will be shortly discussed. In rare occasions, cannabis use can induce a state of psychosis in those individuals that have a genetic predisposition for it. As a result, patients with a (family) history of psychotic disorders, particularly schizophrenia and bipolar disorder, should be under careful psychiatric monitoring when using cannabis. Cannabinoids can have a strong, but temporary, effect on heart rate and blood pressure. Patients with a history of heart disease or receiving any type of heart medicine should use cannabis under careful supervision by a medical doctor. There are indications that use of cannabis during pregnancy can affect the development of the unborn child. Because certain components of cannabis – including THC – are excreted in breast milk, the use of medicinal cannabis is not advised while breastfeeding. There are certain conditions where the risks associated with using medicinal cannabis may be increased. After the use of cannabis, the liver is the main organ involved in chemically altering the cannabinoids as part of its function to remove external substances from the body (metabolism). The effects of cannabis may therefore be significantly different in patients with a liver disease. It is unlikely to develop an addiction when cannabis is used as a medicine. The recommended dose for medicinal use is often lower than that for recreational use, and a medical professional should be involved in monitoring the patient. Patients should take particular care, however, if they have been addicted in the past. High dosages of medicinal cannabis taken over a longer period may lead to addiction. Quitting may then cause withdrawal symptoms, such as mild forms of restlessness, irritability, insomnia and nausea.